In the flurry of events that have begun the Trump Presidency, it’s sometimes difficult to sort fact from fiction, or significance from daily bluster. This presented a continual struggle for the news media during the 2016 campaign, and is even more of a challenge today. National security adviser Michael Flynn offered his resignation on Monday night, senior White House sources told CBS News. President Trump accepted his resignation and named a temporary replacement. Flynn said in his resignation letter that during the course of his duties as incoming national security adviser he held “numerous” phone calls with foreign counterparts, ministers and ambassadors that were “to facilitate a smooth transition and begin to build the necessary relationships” between President Trump, his advisers and foreign leaders. 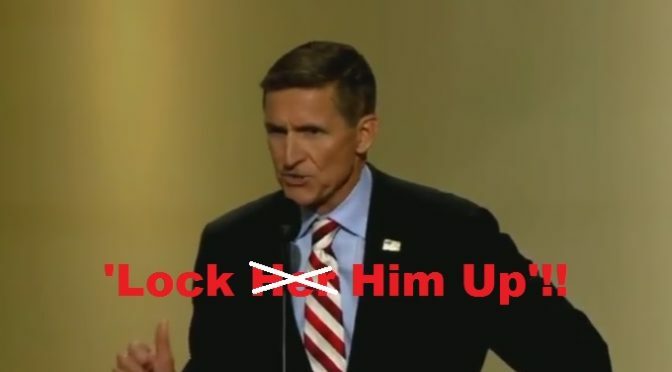 What was that Mr. Flynn said about Hillary Clinton? “Lock Her Up”? 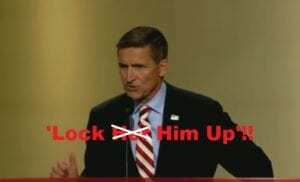 An international firestorm began to swirl around Former National Security Advisor Flynn when it was revealed that he spoke with Russian leaders about the possibility of alleviating sanctions once Trump took office. And even after the resignation, this crisis is only deepening for the Trump Administration, as journalists continue to decipher exactly what the President may have known about these talks. Thus why this situation is historic… it marks the first time the Trump folks have been held accountable for their questionable actions. After a continuous succession of false statements, blatant denials and potentially dangerous missteps, the President and his team are FINALLY starting to bear consequences for their actions. This is one complexity that a late-night Twitter rant simply will not repair. With a Congress that seems to look the other way at every Trump misstep (where did those constant cries of ‘Executive Overreach‘ go?!?! ), the American People are now limited to the Fourth Estate as their primary watchdog in Washington. Looks like we are starting to make use of it.